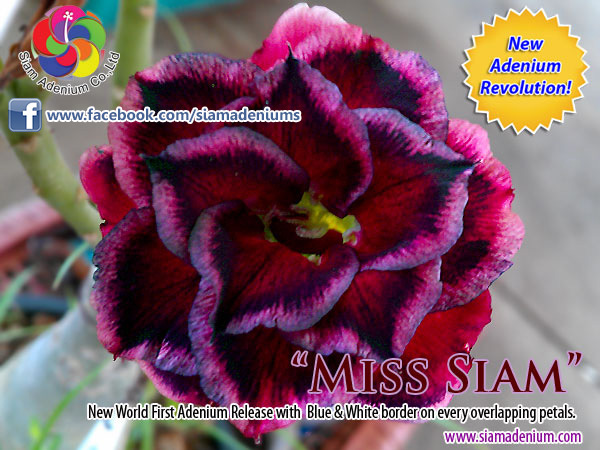 Today I would like to share new world Adenium trends with “Tower” form. 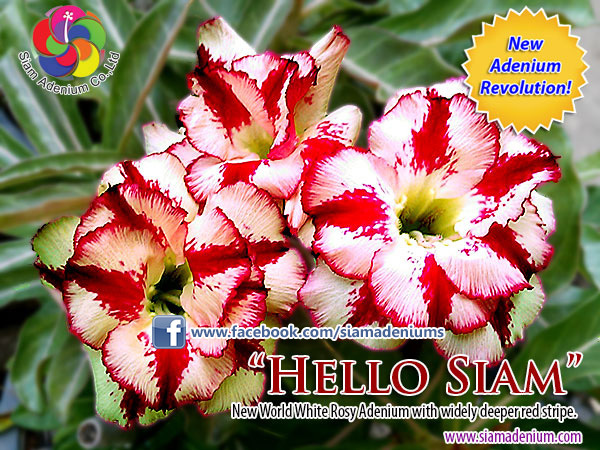 This is new hybrid from Adenium Somalense var Somalense. 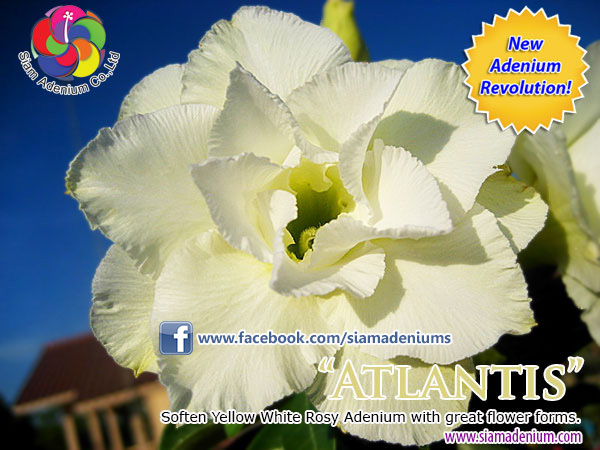 First, let’s get to know adenium somalense first. 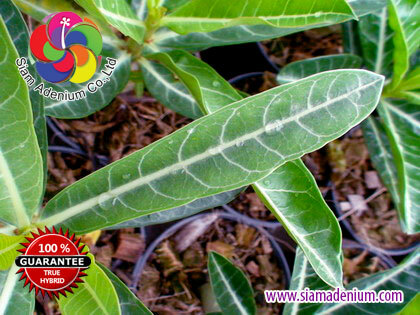 and more distinctive clearer white vein or skeleton on middle leaves. 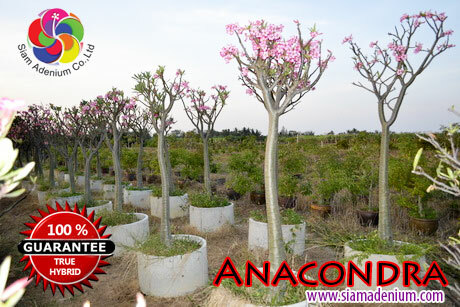 “Anacondra” mostly has one trunk tower form and give or sprout 3-5 branches on top. 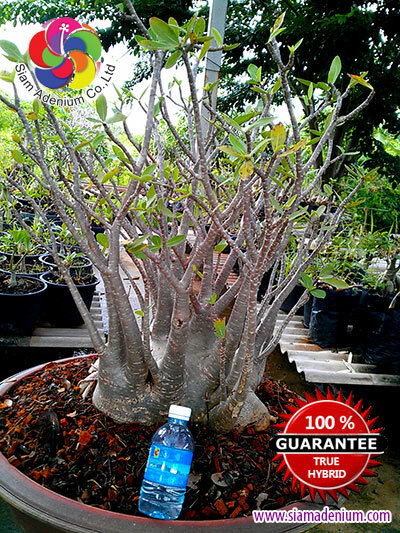 The caudex skin is different from original somalense with clearer caudex & branches internodes. 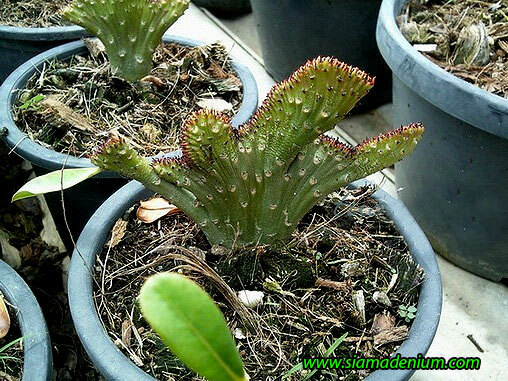 This internode is special unique of “Anacondra” and very attractive point. 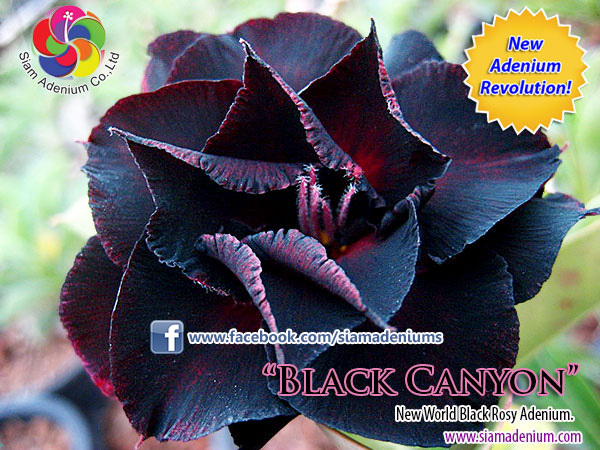 Some can also give black skin. 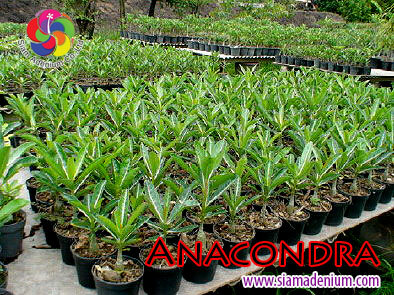 “Anacondra” can also grow up with over 20 feet comparing with normal somalense 10-15 feet tall. 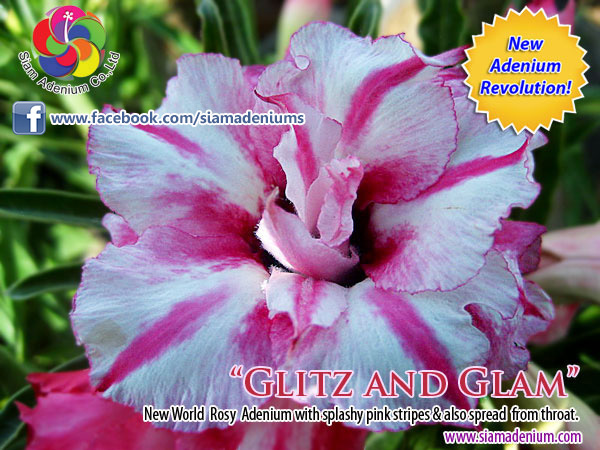 The “Anacondra” flower is bigger than original Somalense and brighter with deep pink petal border. 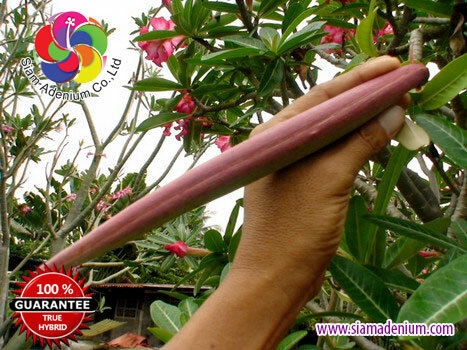 “Anacondra” has also five deep pink stripes from throat. 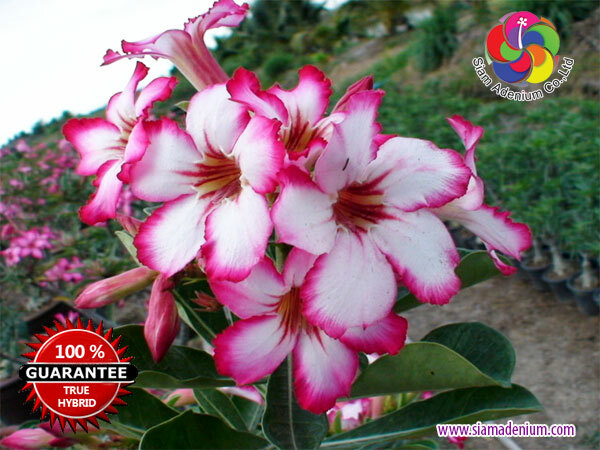 The original Somalense flower varies from pink to deep red, and, as in A. obesum, the color fades toward the throat. 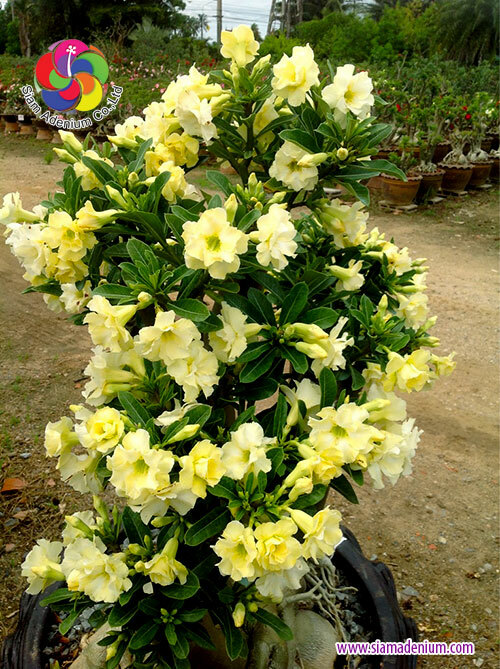 The flowering period of cultivated plants is usually from autumn through early summer but is considerably influenced by culture. 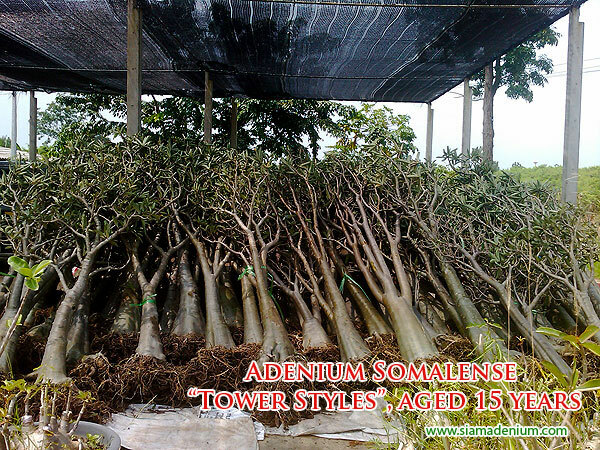 One trunk tower form with bushy branches on top. A ha! 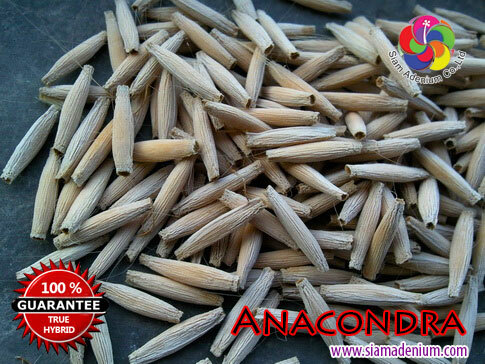 I think now you will get an idea of “Anacondra” benefit. Here is the answer. 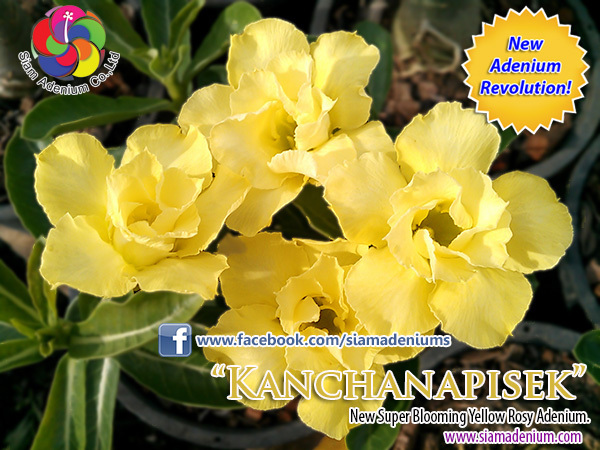 According to the highest sap power of “Anacondra”, this would help scions or grafted flower branches give better and higher blooming than other adenium hybrids rootstocks or I can say “Anacondra” is the best adenium rootstock for grafting use in term of heavy grafted-flower blooming. 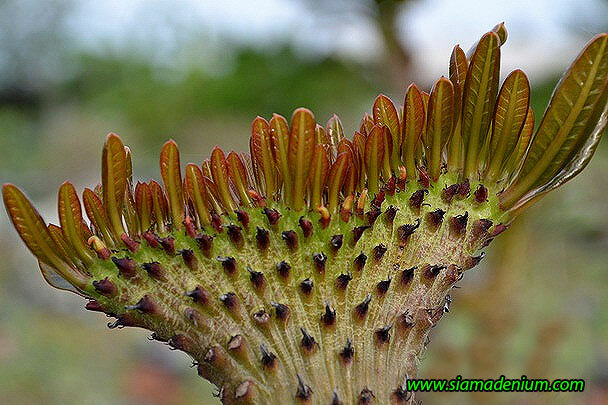 "Anaconda" top branches can also give new sprout branches easier after triming or cutting so they can be grafted more and make bushy flowers on top branches. 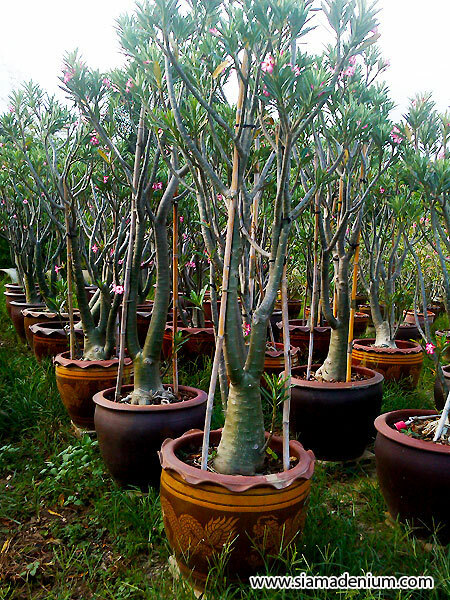 “Anacondra” is a new world trend adenium form with “BIG TOWER” style like "Eiffel Tower" totally different from normal other chubby adenium form seen mostly in adenium world. 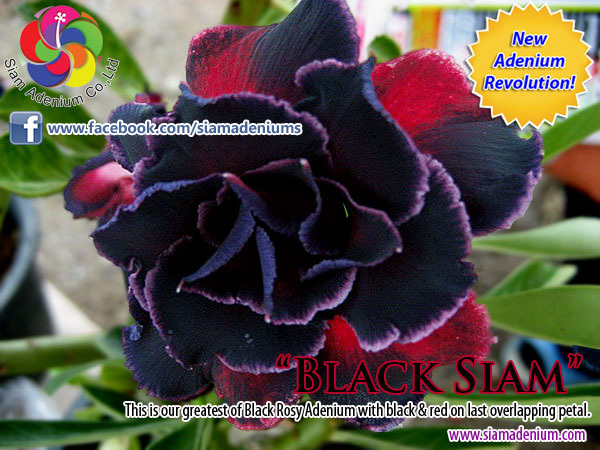 “Anacondra” is great for your mansion, landscape, park or castle’s plant decoration. 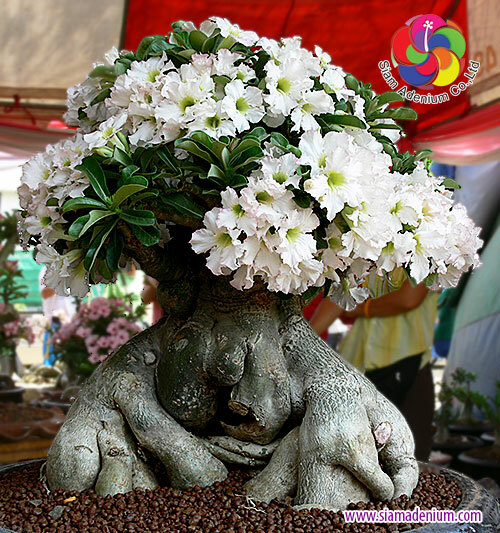 Not only "Anaconda" is attractive with "Tower" form, but it can make more beautiful with other flowers' changing by grafting its flowers instead with other beautiful adenium flowers on top of branches. 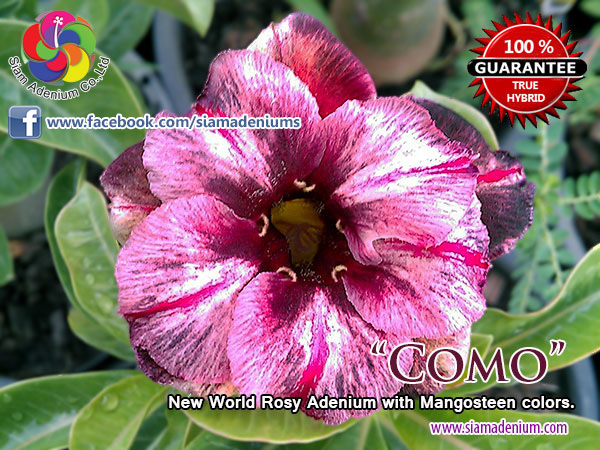 That means, if you aren't happy with "Anaconda" flowers itself, we can change them to other colorful flowers by do grafting with your chosen flowers from our catalogues on them. 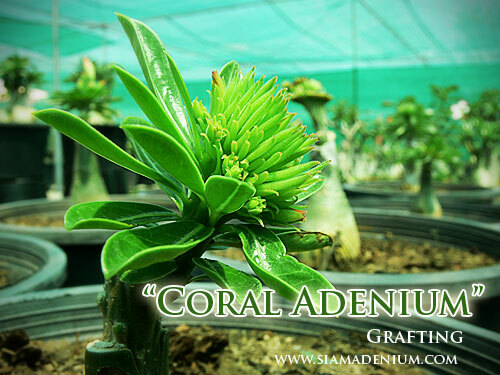 This is our pre-order services and it takes about 30-40 days for grafting process. 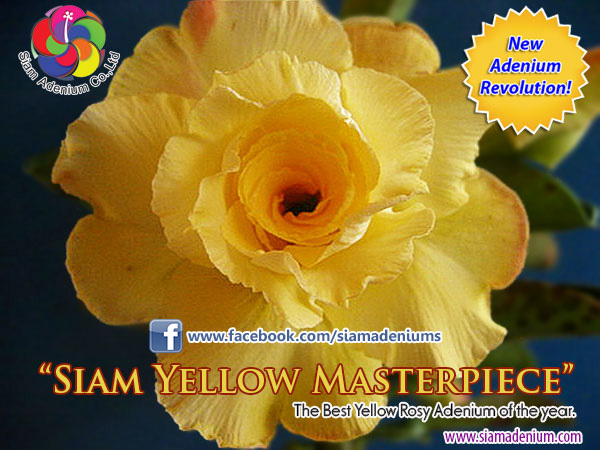 Just let us know your chosen flowers and we will graft them for you. 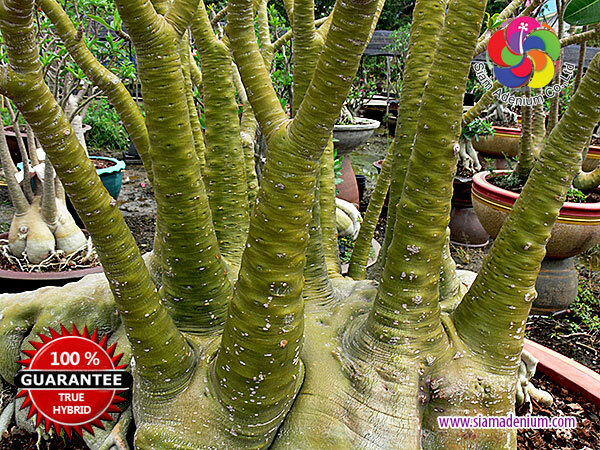 "Anaconda" medium size, 1.50-2.0 metres tall, aged 4 years, ready rootstocks for grafting. 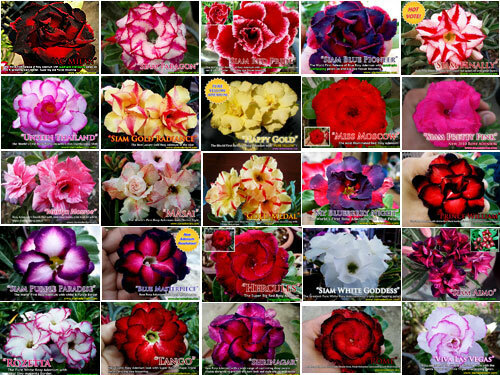 flowers' selection from our catalogues. 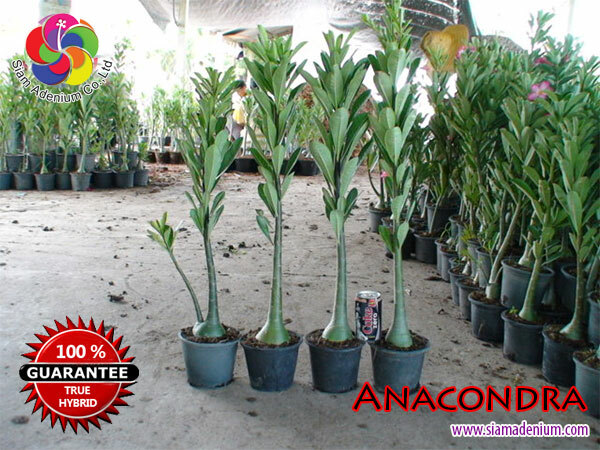 You can see our "Anaconda" categorized by sizes below. ok, I think that's all for today. 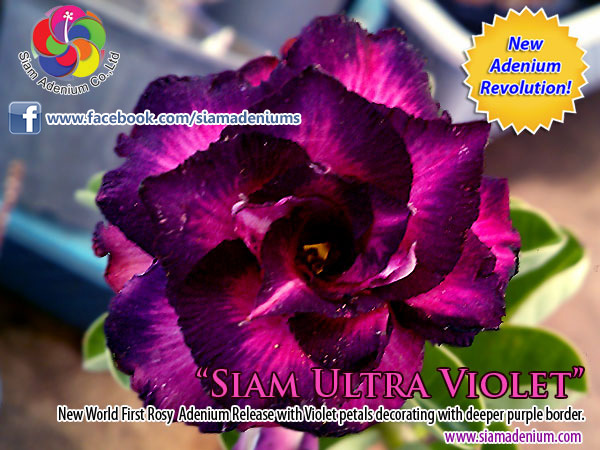 Please email choochart@siamadenium.com or facebook me for your any questions. Have a nice day. 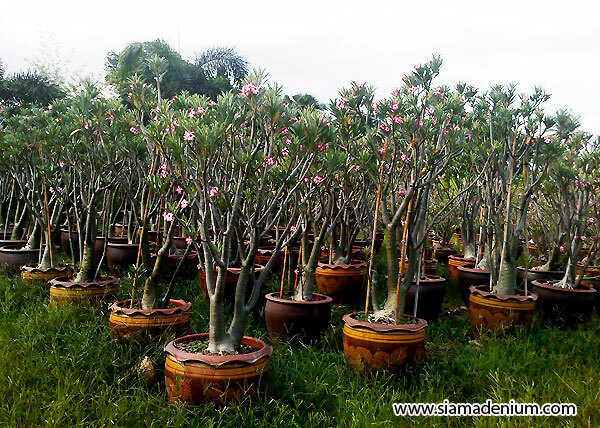 "Giant Tower Size", We can provide you with grafting services on your own flower selections. 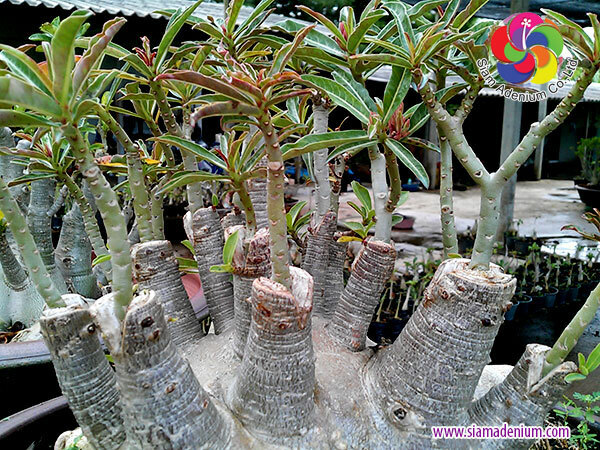 Seedlings, 2-2.5 inches caudex diameter, aged 1 year, great rootstocks for grafting. 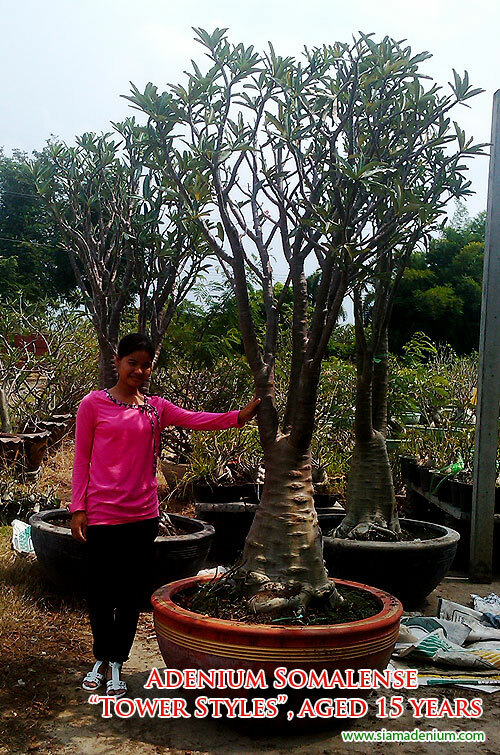 1-1.50 metres tall, aged 4 years, great for showing in your house, landscape, park and resort. 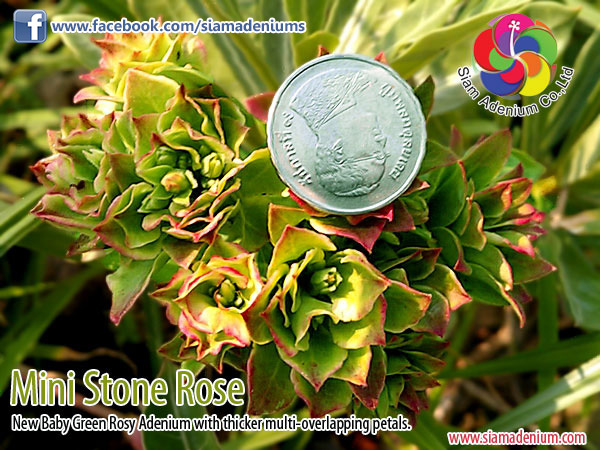 1.80-2.00 metres tall, aged 4 years, great for showing in your house, landscape, park and resort. Ready to export. 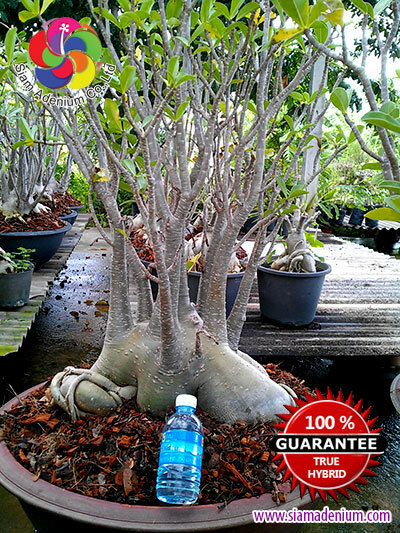 We can also ship them with bare roots via container sea freight. Today you might be surprised what I mention with the Beast. 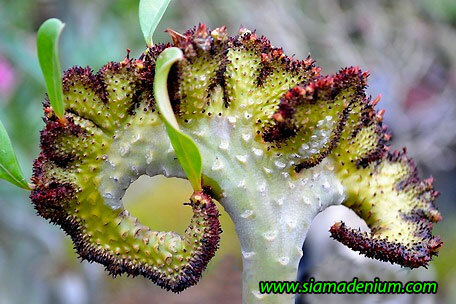 Why the Beast is related with Adenium? 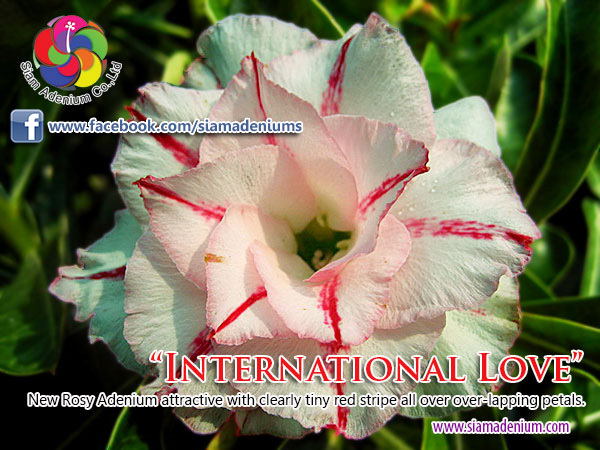 Most plant lovers know and think that Adenium has only flower’s attraction. 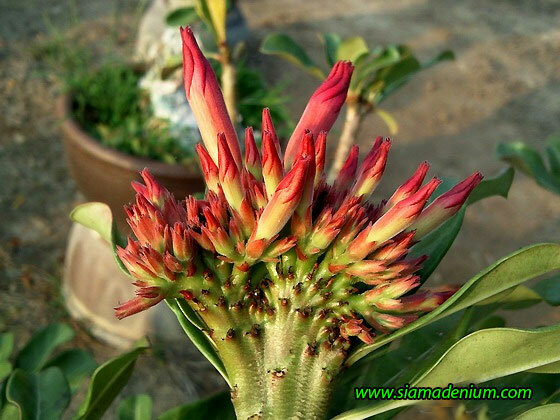 The attraction of flowers most happens on “Obesum” hybrid. 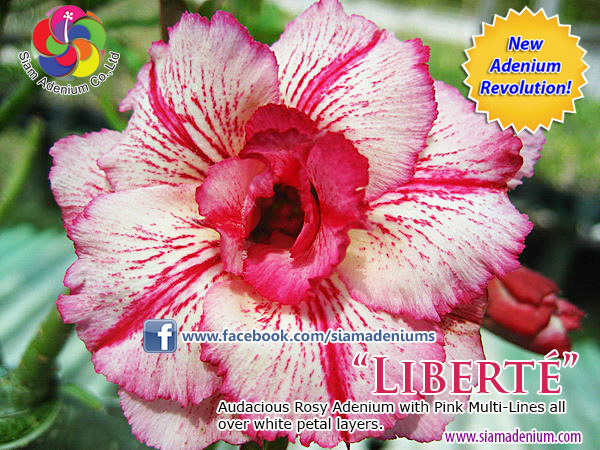 “Obesum” can give too many flower varieties, colors and styles. 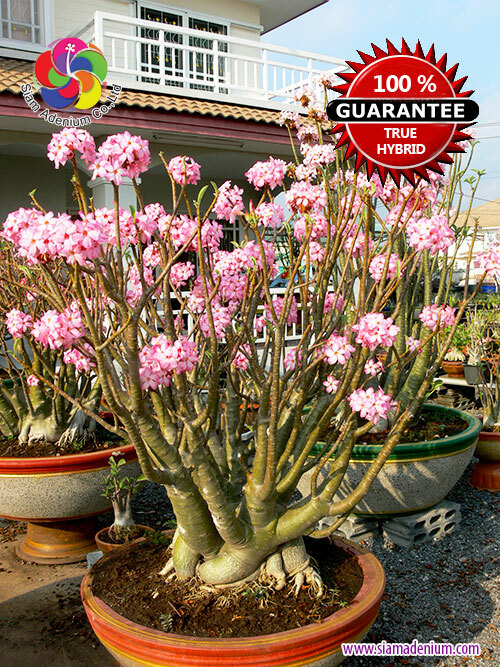 Most breeders like to develop on only this hybrid. 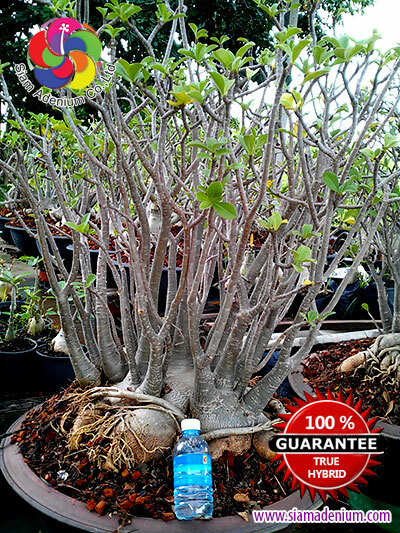 "Arabicum" root stock can be grafted with 10-12 flowers colors or varieties. 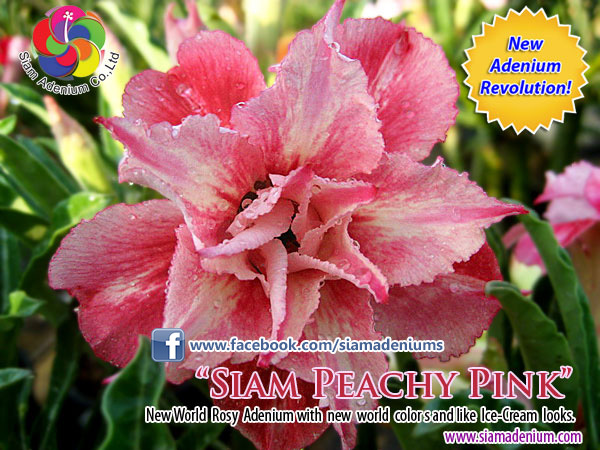 this century to create a new idea on Adenium World. From now on, you will see what “Beauty and the Beast” look like. 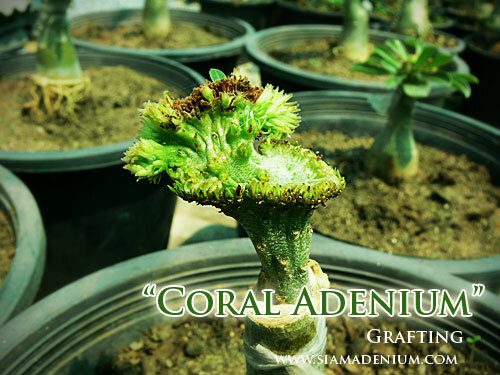 push other hybrid scions out of their branches after finishing grafting. 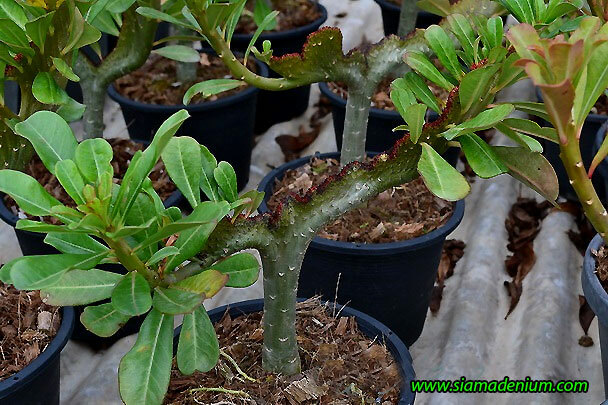 Another problem is that “Arabicum” branches when it was cut for grafting will give much more white elastic liquid and stickier than “Obesum” on top of cut branches (see the photo), this will take more time on grafting process to make sure branches and scions are linked well together. 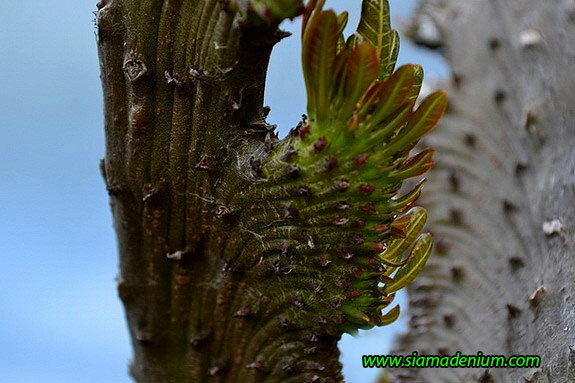 We can solve these problems by using longer “V-Grafting” technique. 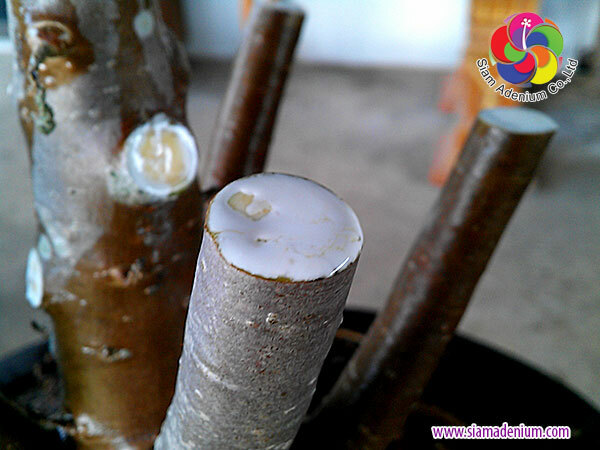 White Elastic Liquid after cutting root stock branches prepare for scion grafting. 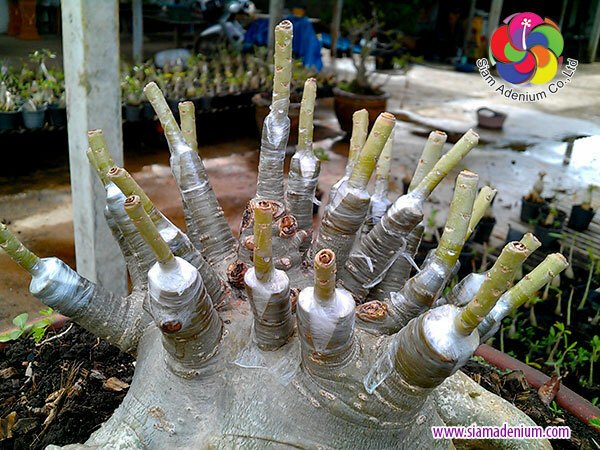 Just choose the Rootstock codes and flowers, then we will start grafting them for you. 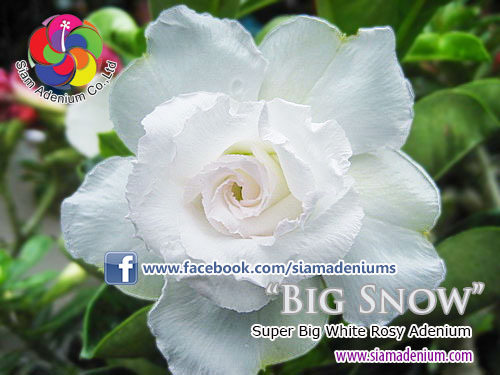 “Beauty and the Beast” is great showing “power” with giant size and sweet flowers in your garden, park and landscape. 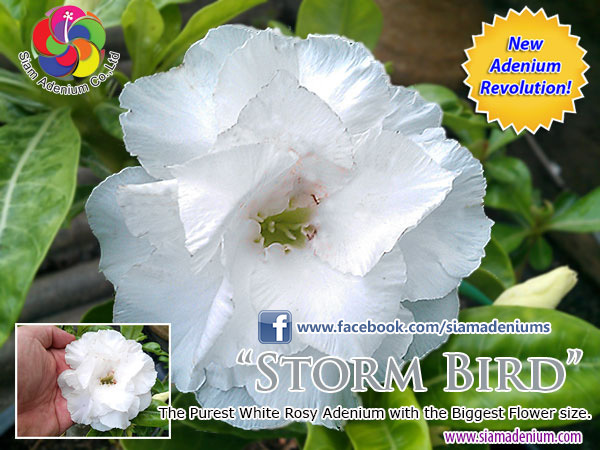 Now it’s available with pre-order. 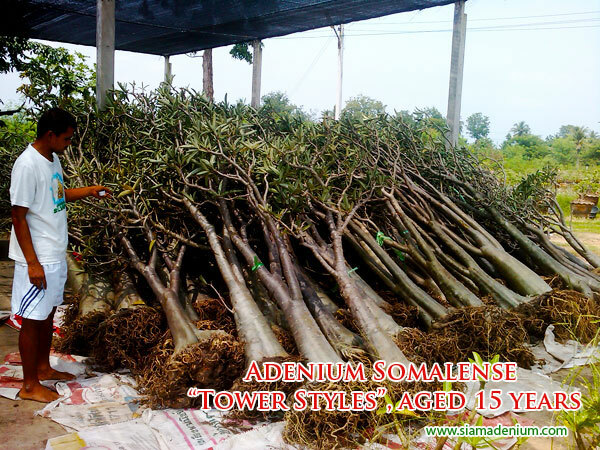 We have “Arabicum” rootstock codes for you as below. 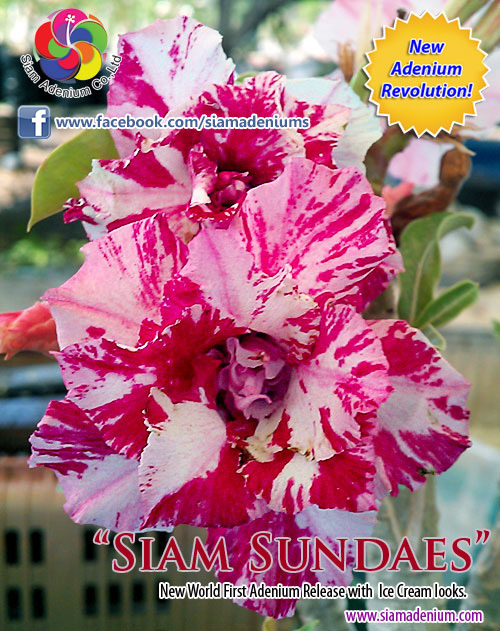 All you do is just select the rootstock code and choose the flowers grafting on our catalogues. We will start grafting them after receiving your order and ship them via air freight. Ok, I think that’s all for today. 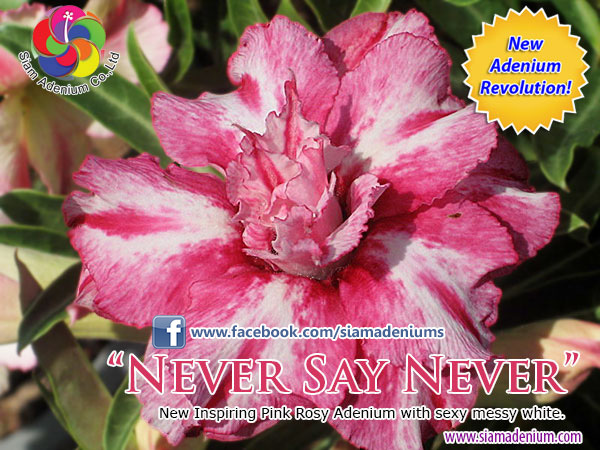 I will share new idea or technique of Adenium next time. Have a nice day. 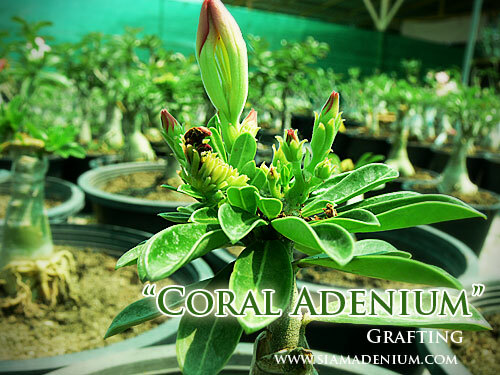 In our Adenium’s community, we have separated Adenium upon attraction in 2 main sections. 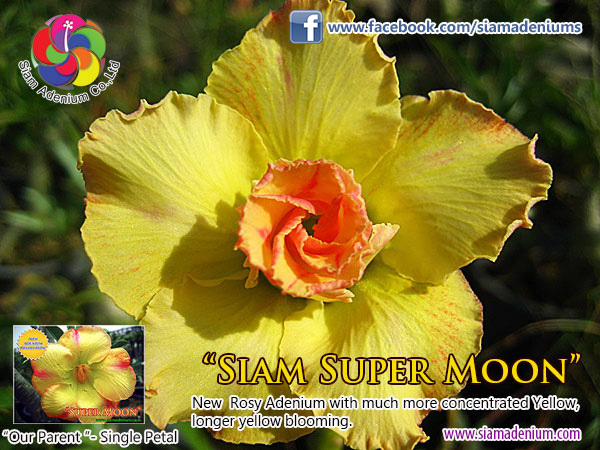 The first section is flower playing which most popular in group of growers and players. The second one is “form” playing; popular in some groups e.g. 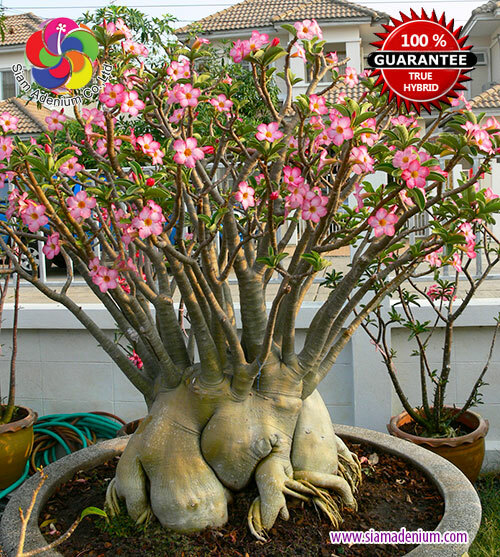 bonsai players, plant collectors, special landscape business, seriously focused on the “TRUE” hybrids. 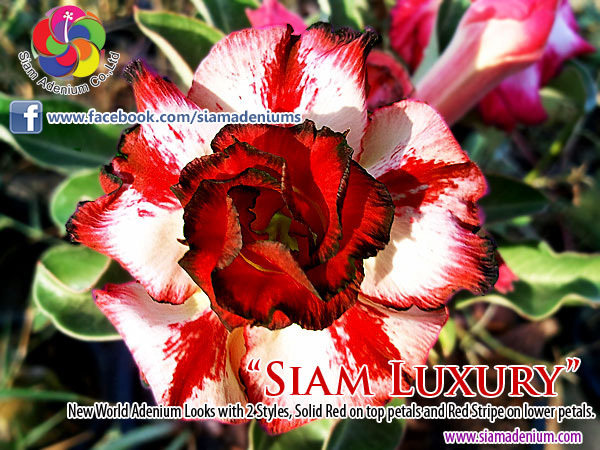 Adenium hybrids in the first section are mostly on Adenium “Obesum”, “Multiforum” and “Somalense” but hybrids in the second one are “Arabicum” and “Socotranum”. 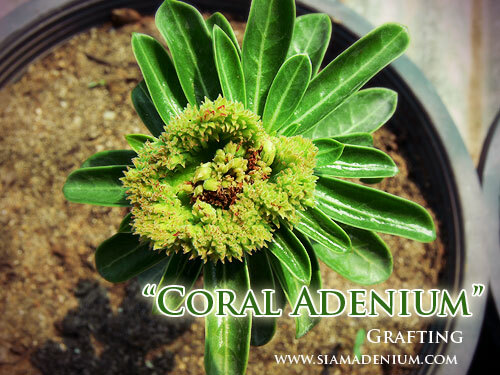 This time, I am going to talk about the second section or “Adenium form” only. 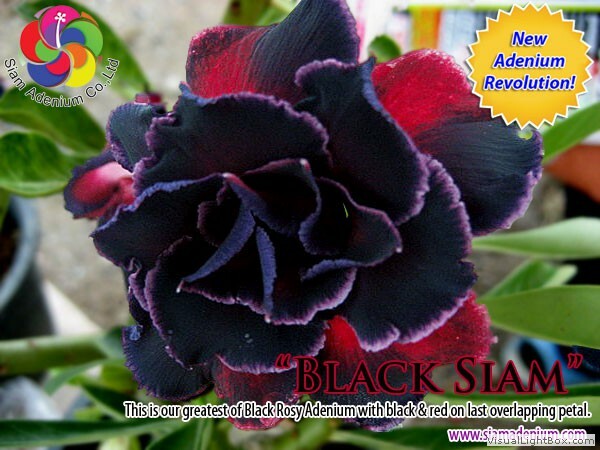 Why do we need to focus on “TRUE” hybrid? 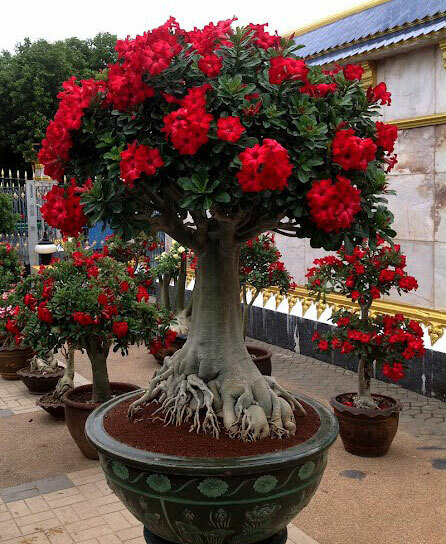 The answer is “Time” for maintaining and growing Adenium takes longer than flower Adenium or Obesum. 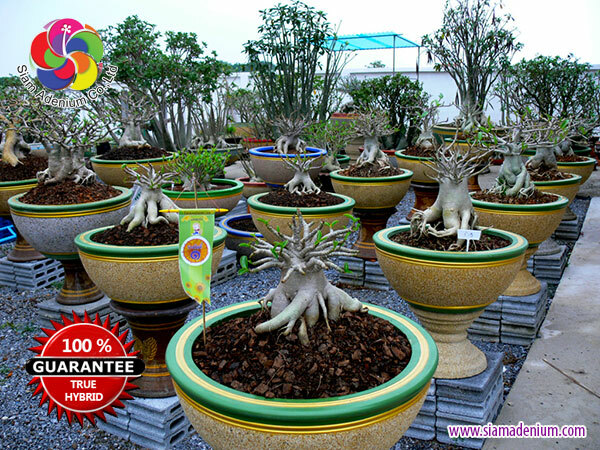 In Bonsai sight, we have to choose or select the good plant structures which have ready components to build up bonsai plants. 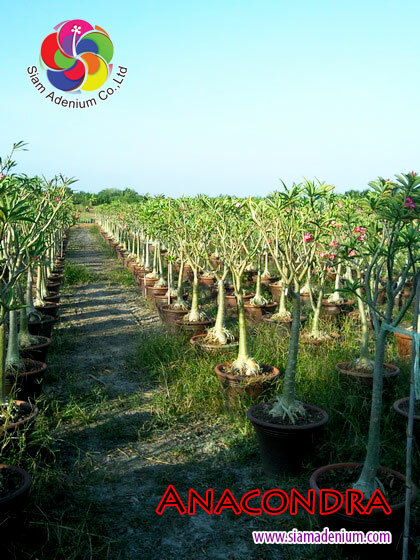 We don’t waste time to choose the incomplete plant to do the plant organizing or maintaining. 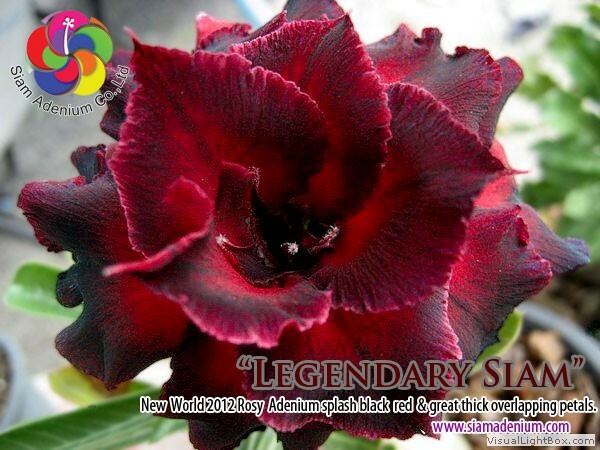 This was our first begin to find and produce the best hybrid to produce new plants having the good structures for giving fun to players and collectors. 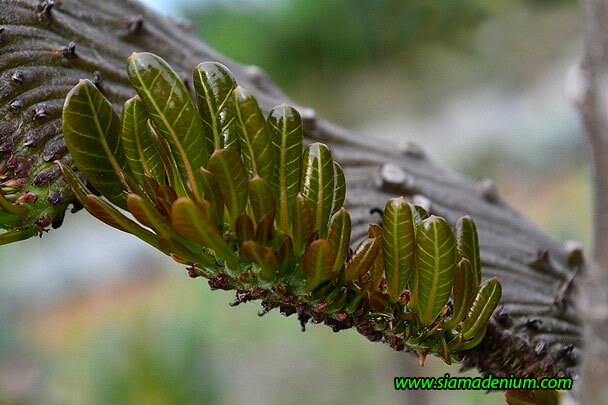 symmetric branches, spread roots, etc. 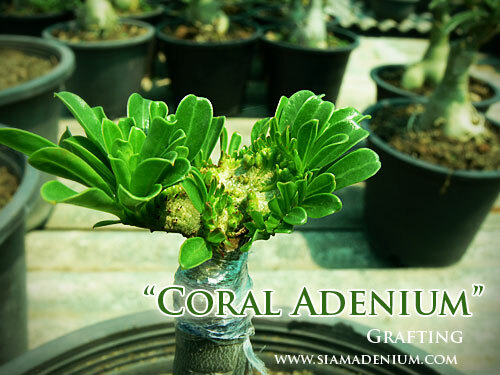 Unfortunately, not for all Arabicum and Socotranum varieties can give these factors. I hope you don’t wanna waste your time on growing with normal or original hybrids anymore. Let’s see how we solve this problem? 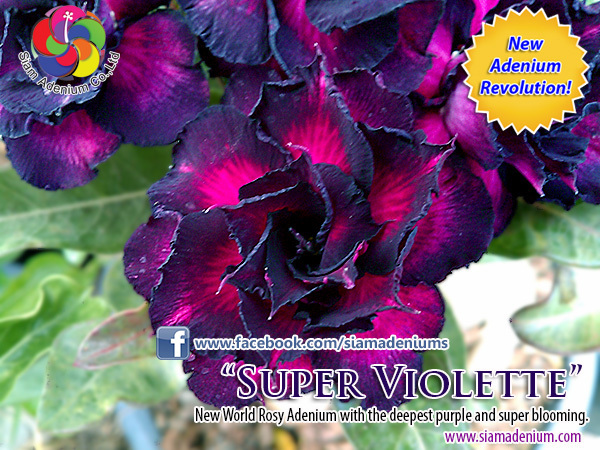 We have spent time for 7 years to discover which varieties are great to give these factors. 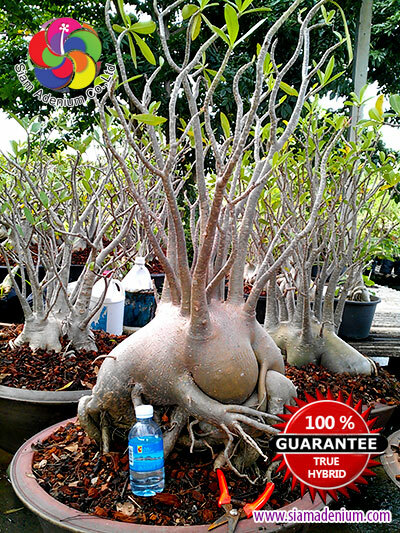 We have found that original Arabicum or Socotranum hybrids themselves cannot give the ready perfect branches, caudex and roots. 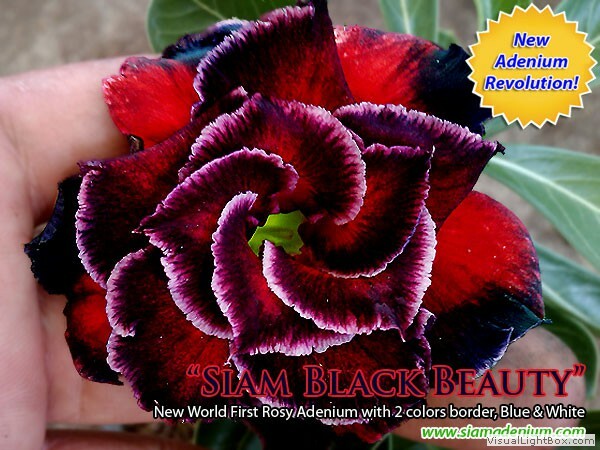 There are 11 Arabicum varieties (PWN, RCN, LBR, etc.) 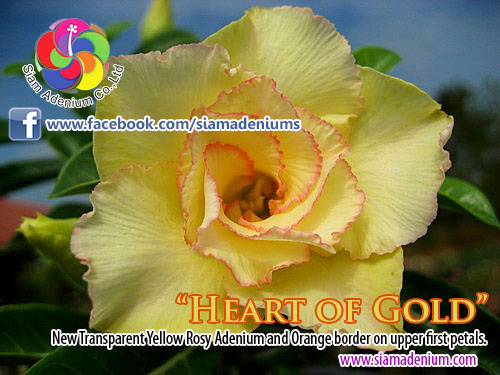 and 5 Socotranum varieties (Golden Crown, Diamond Crown, S1, Petch Ban Na, etc.). 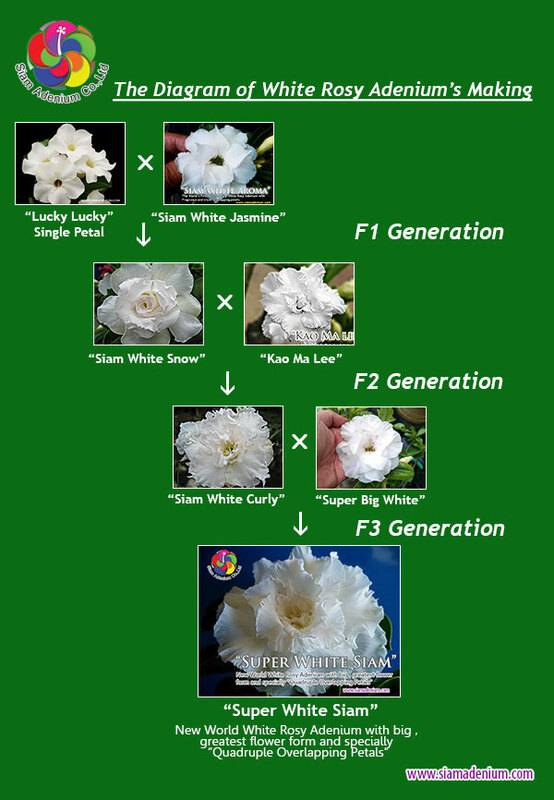 That was why we have to breed and develop all of these variety groups to create the newer generation of mother plants much easier to provide the factors above. 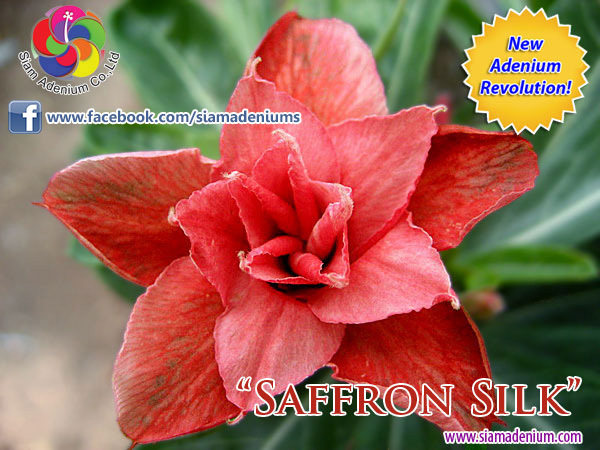 From now on, we choose these new generation plants to be new mother plants. 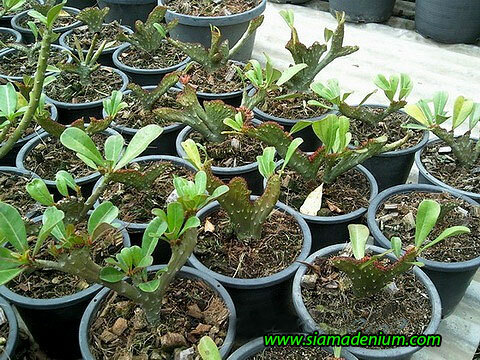 We tried growing the new baby seedlings from these new mother plants and really satisfy with this growing. 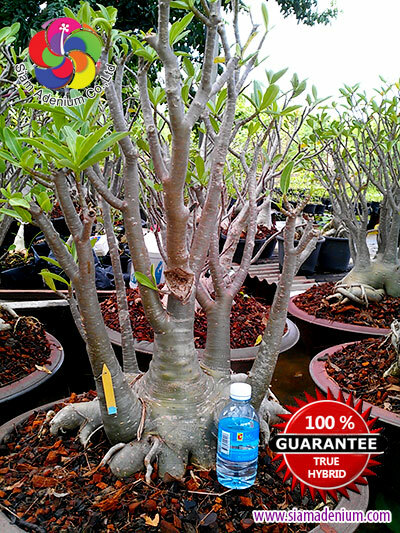 We have set our Mother plants as new generation of “TRUE” hybrids for producing new seedlings ready provide with great quality structures (perfect branches, caudex, and roots). 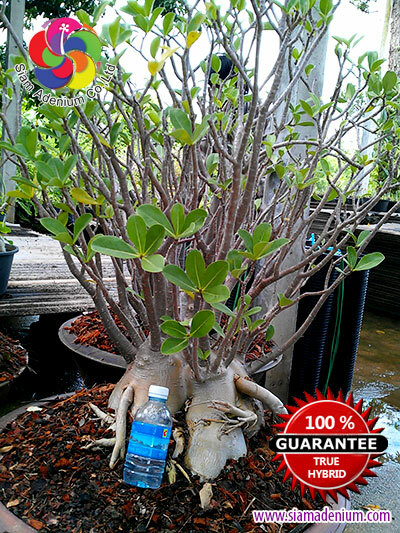 These “TRUE” mother plants hybrids are available in our nursery only so you will be sure that you will get the great Adenium plants from us. Have a great day. 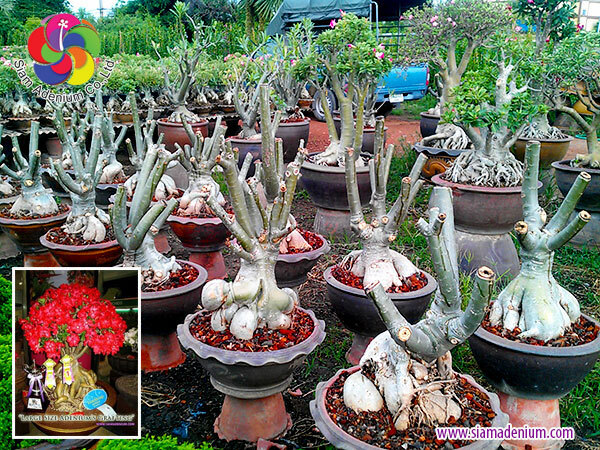 Adenium Large Caudex grafting with super blooming white flowers. 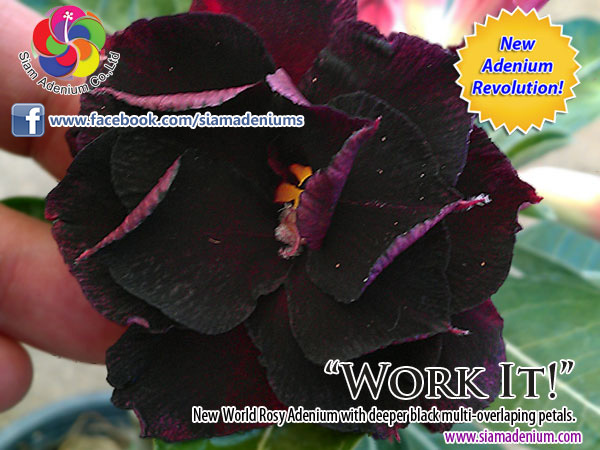 Today I would like to share how I produce new world “White Rosy Adenium” looks. 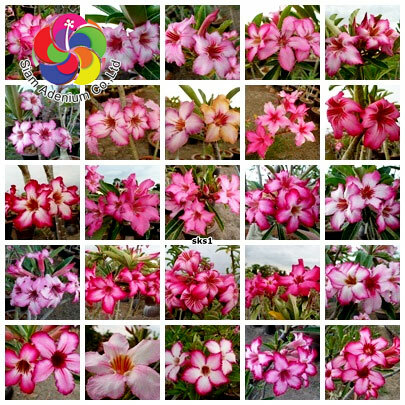 To produce Adenium flower on your mind, first you have to set your flower’s goal or imagination up to varieties of flowers in your hands. 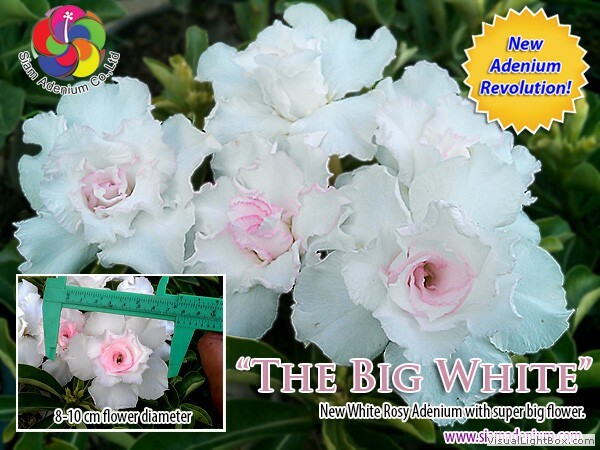 My goal this time is that I would like to create new White Rosy Adenium with “Big”, “Curly Petals Border”, “Pure White”, “More over-lapping petal layers” and “Perfect Rounded shape”. I set up my working timeline for 2 years following with my goal mentioned above. 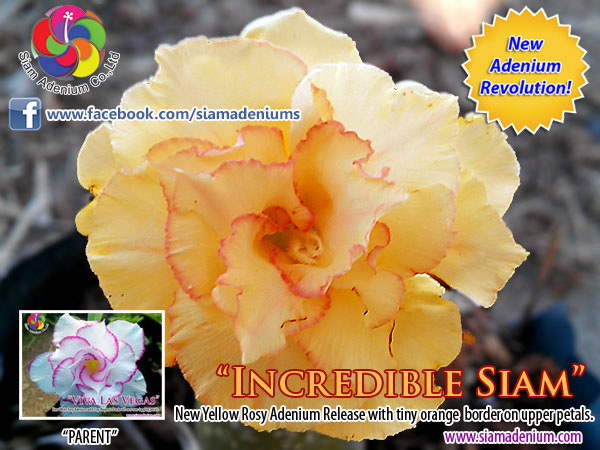 As I said before, the more beautiful Baby Adenium is up to single petal as mother, the more beautiful single petal Adenium, the more beautiful Rosy Adenium. 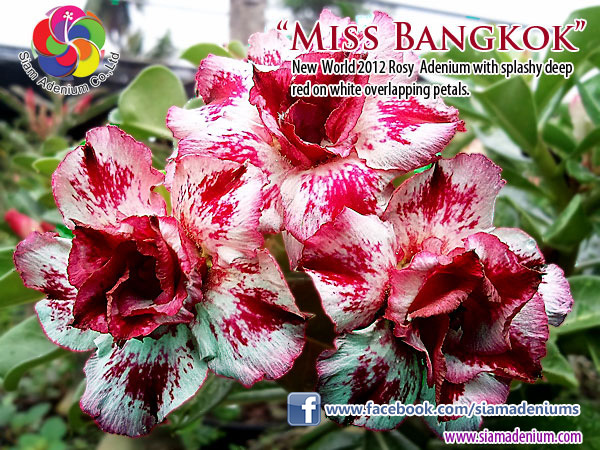 I use the single petal as mother and use white Rosy Adenium as father (pollen). You can see this idea from my previous articles as below. Ok, let’s start. Our new world variety outcome from our development following with this work. 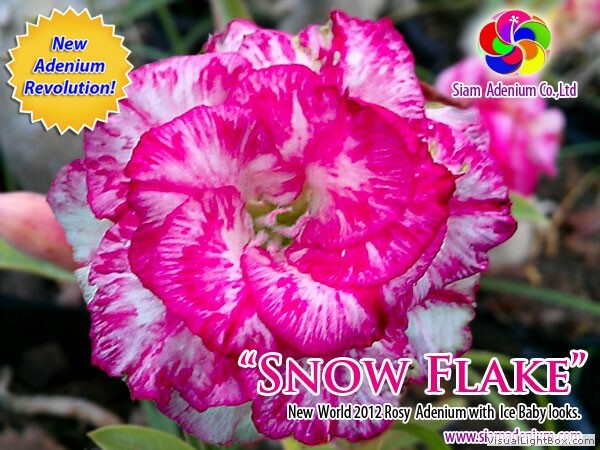 Our new white Rosy Adenium's Development petals and rounded shape, I named her as “Siam White Snow” (please see our diagram). I was pretty happy with this result but not hit my goal yet. I have started working on it again. 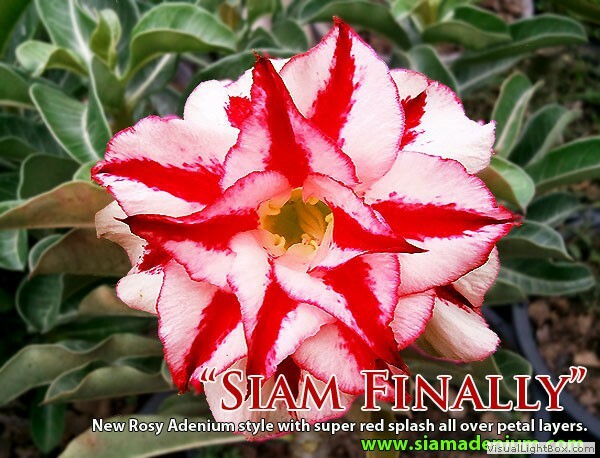 This time I kept choosing “Siam White Snow” as mother and select new Rosy Adenium “Kao Ma lee” as Father. 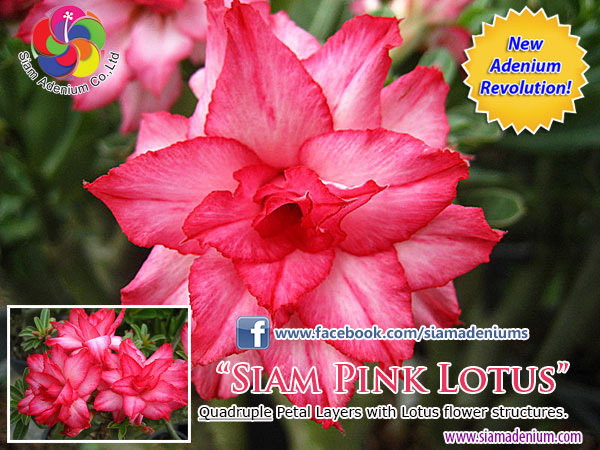 The good point to use “Kao Ma Lee” as father because she has got many petal layers and her petals are pretty tight and also a little bit curly petal at border. 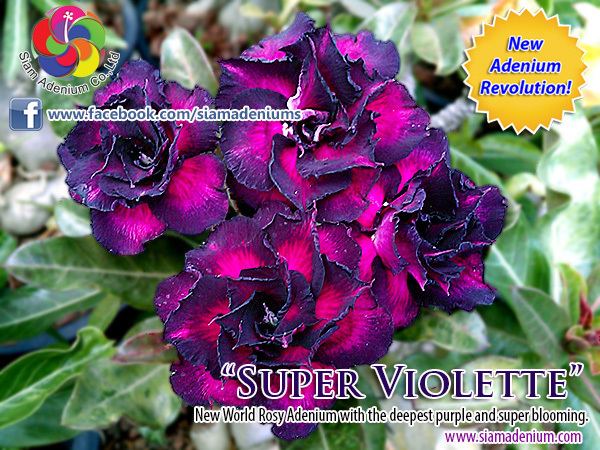 The new baby came up with “super” curly border and more over-lapping petals (4 petal layers). This result is better than I thought; I was very impressive with my work. 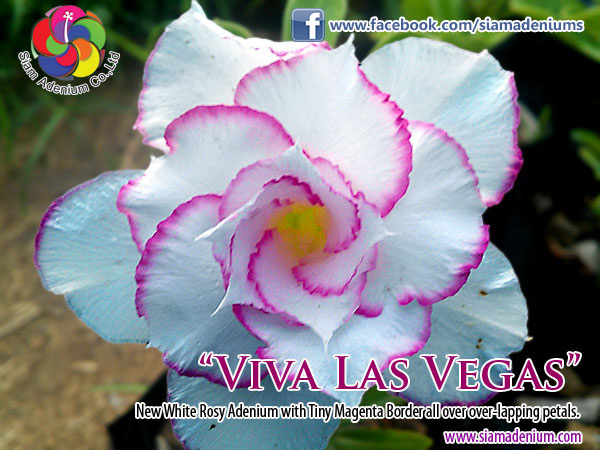 Unfortunately, flower border was too curly (ha ha ha) so I need to work it one more time. 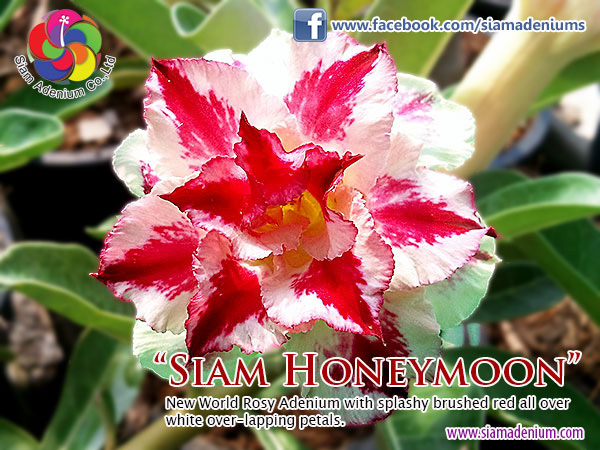 I gave her new baby name as “Siam White Curly”. 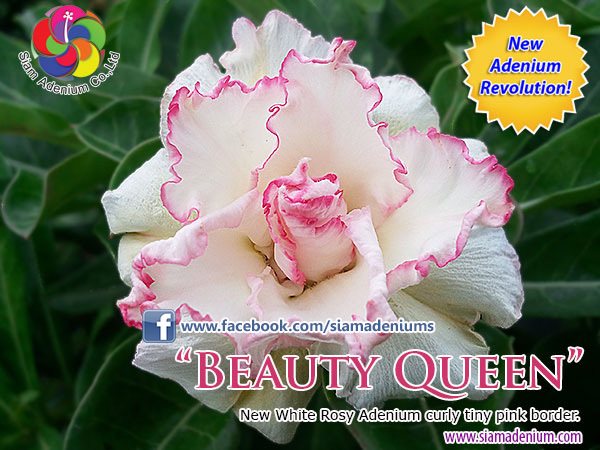 This time, I used “Siam White Curly” as mother and chose Rosy Adenium “Super Big White” as Father. 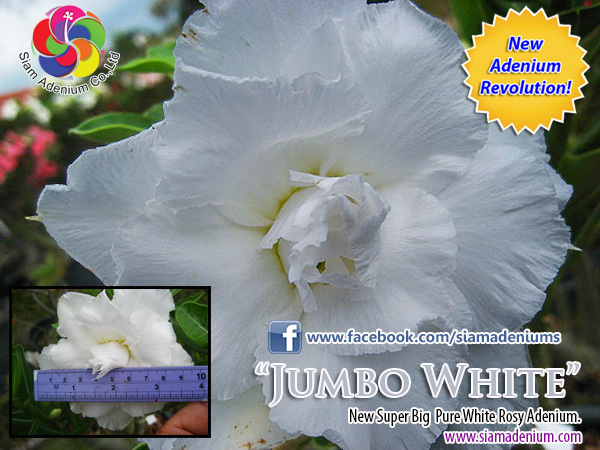 “Super Big White” has very big flower size with great form. 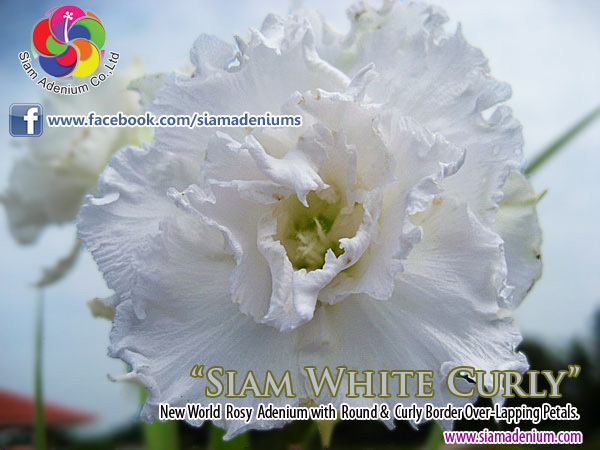 This variety can help “Siam White Curly” less curly petals border. The new baby is very amazing and makes me more stunning than I thought again. She comes up with all complete of my primary goal set as beginning. 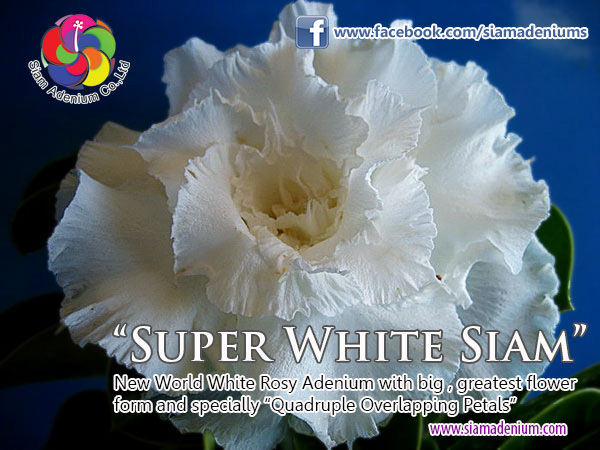 She has “Quadruple Over-lapping Petals”, Pure White, great shape, Big Flower, and a little bit curly around petal border. 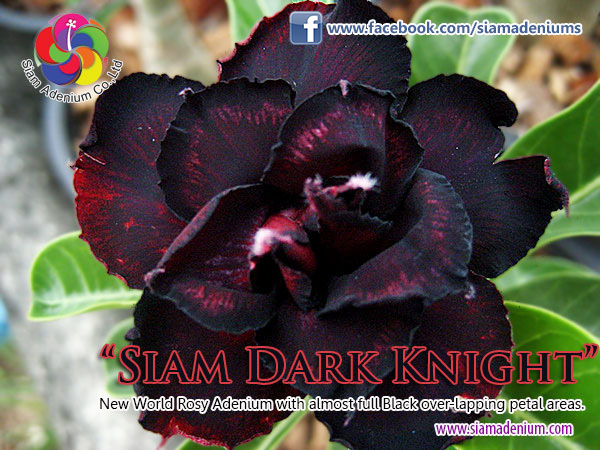 Of course, I named her as “Super White Siam”. “Siam” means “Thailand”. This development timeframe takes about 2 years. You might think this is too long to do but I don’t think so. 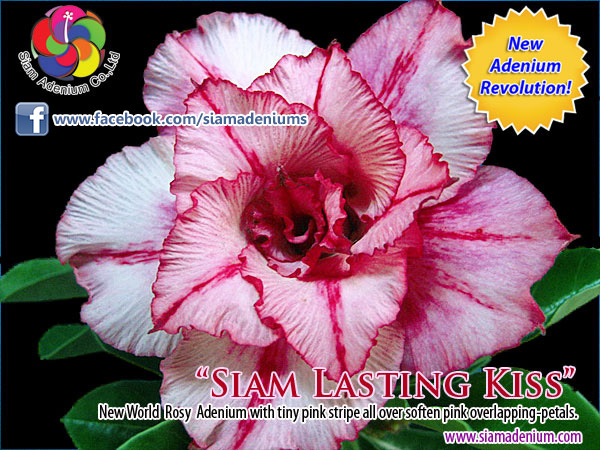 I have never stopped crossing or producing new world Adenium flowers so I have many new baby ones waiting for blooming. 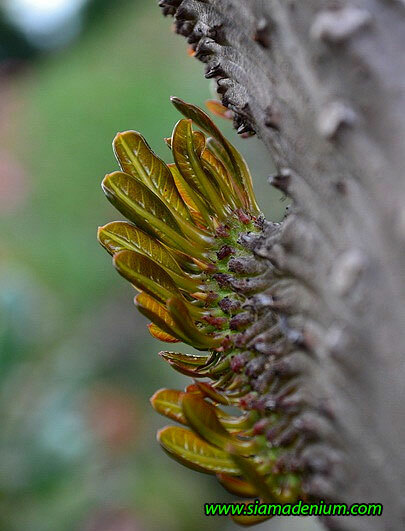 Just keep doing more and more and you will forget the time for blooming waiting. Ok, I think that’s it for today. 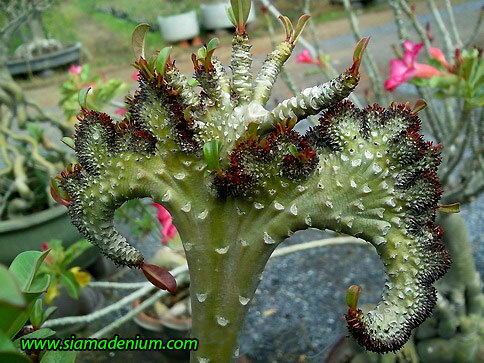 I will share new Adenium technique next time. 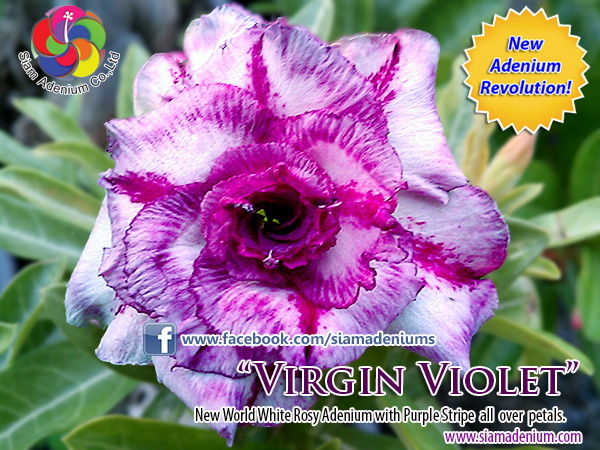 Have a nice day, bros.
"RARE ADENIUM" available only here! 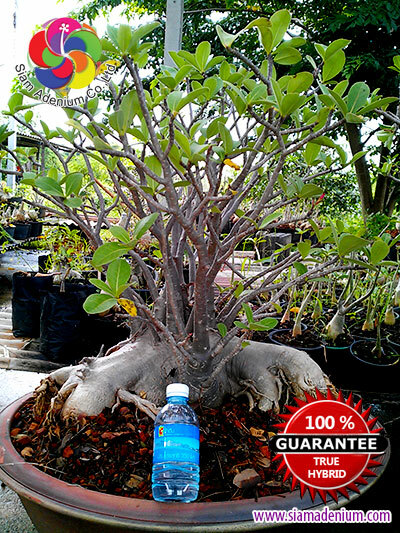 "Mermaid" Adenium is 100% Cristata Stability, (new coming branches will always become the same cristata), "Air Layering" plants & Growing in 6 inches pot diameter and price is 50 USD per plant with limited amount. 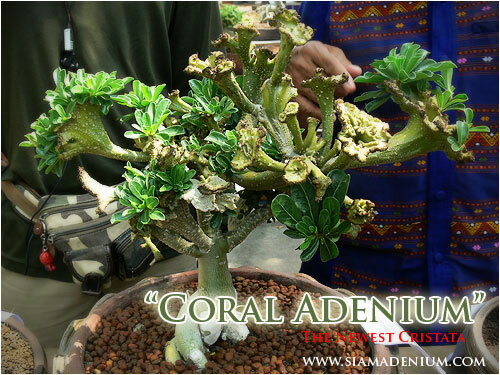 "Coral" Adenium is also 100% Cristata Form's Stability (new coming branches will become the same cristata form). 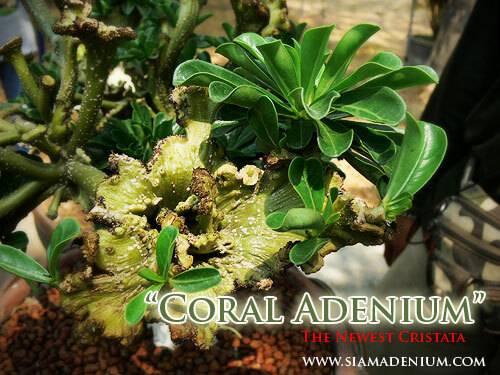 This is our newest Cristata Adenium, and very rare and unique. Her wall style will be spin around when she is growing and getting bigger. 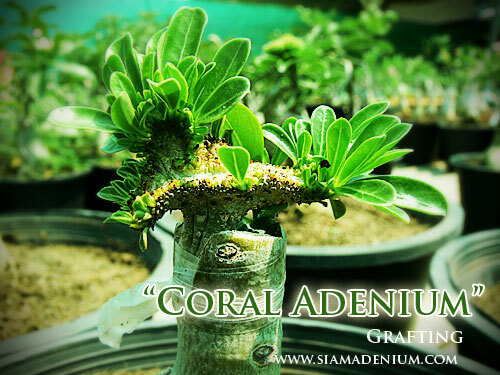 Avialble now with grafted adenium growing in 8 inches pot. 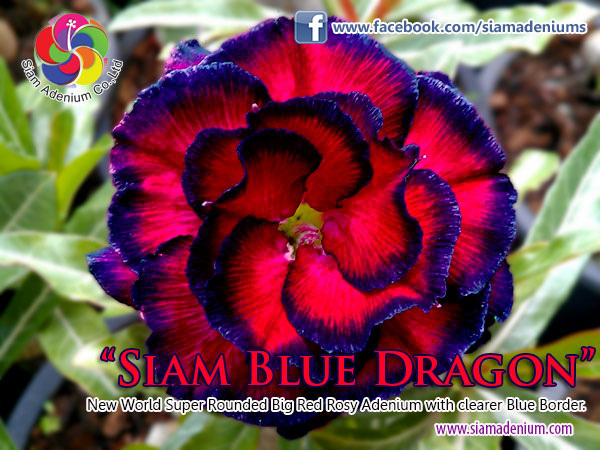 Price is 60 USD per plant. 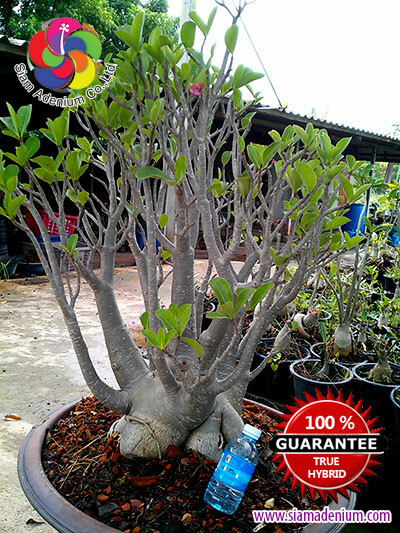 Our Large Adenium Bonsai prepare for grafting on your own floRoostockswers choosing. 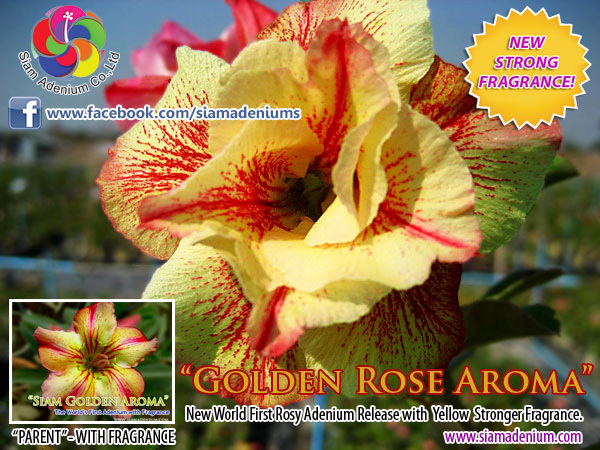 We just released the new Rosy Adenium (Multi-Overlapping petals) seeds from hand crossing pollination. 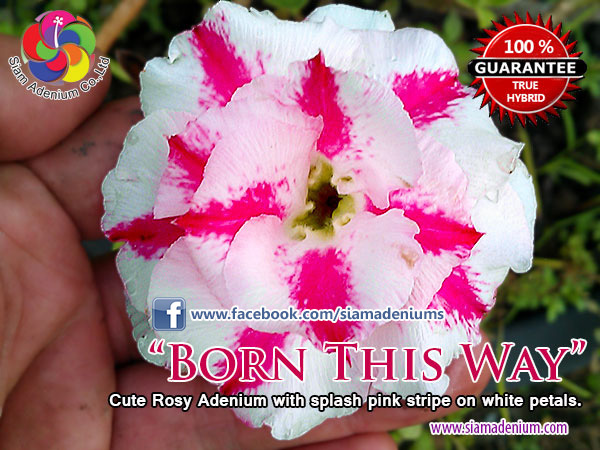 We selected our good quality of parents to produce these seeds, That means you will get new and beautiful cultivars from growing these Rosy Adenium seeds. 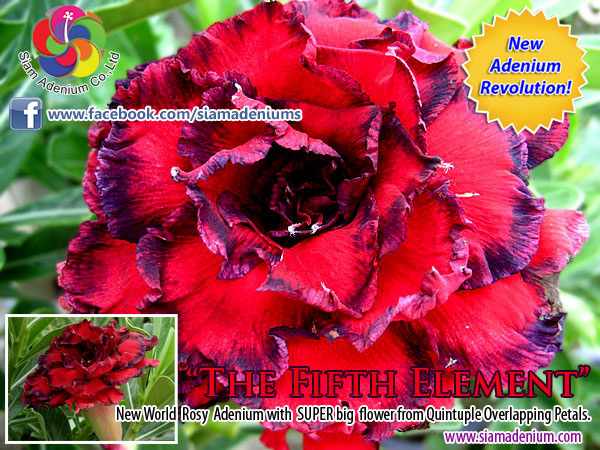 The Most Rare Adenium in the world. 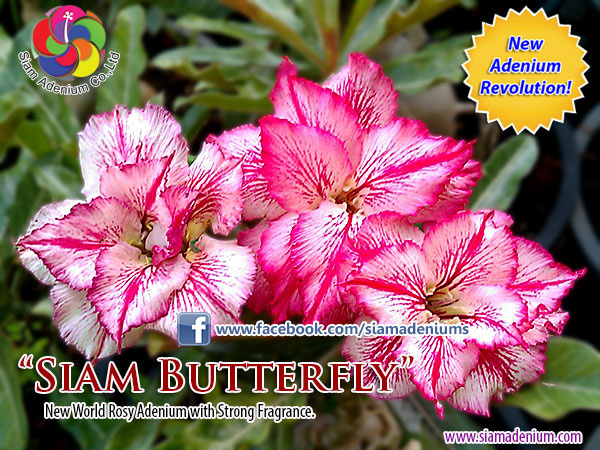 The World's First Adenium with Fragrance.